In 1985 the New Zealand dollar was floated. This meant that the market would control the international value of the dollar instead of New Zealand. The idea was that balance-of-payments crises would not occur because the currency would self-correct. In practice, balance-of-payments problems continued to occur. 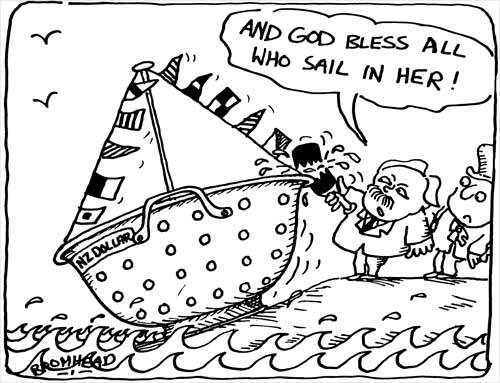 This cartoon, featuring Minister of Finance Roger Douglas, takes a rather negative view of the float – the boat is a kitchen colander and thus full of holes.